New Delhi, March 30: The Indian Space Research Organisation (ISRO) is set to launch the EMISAT or the Electronic Intelligence Satellite at 9:30am on April 1. Along with EMISAT, 28 other satellites of international customers, including those from Lithuania, Spain, Switzerland and the USA, will be released into the space. 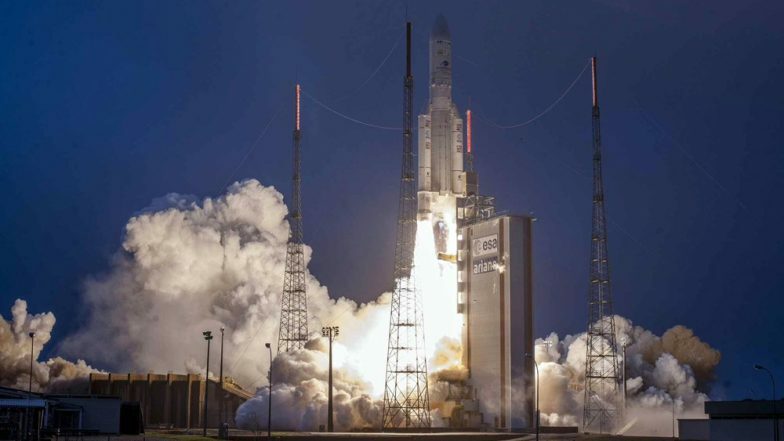 The 436-kg EMISAT and other satellites would be launched from the Satish Dhawan Space Centre in Sriharikota, over 100 km north of Chennai, onboard the space agency's workhorse Polar Satellite Launch Vehicle (PSLV) C-45, ISRO said in a statement. The launch would be subject to weather condition, it added. All You Need to Know About the Electronic Intelligence Satellite. In its tweet, ISRO on March 28 tweeted saying that the PSLV C-45 has moved to the 'umbilical tower' at the Satish Dhawan Space Centre in Sriharikota. “Electrical checks are on now ahead of scheduled launch with #EMISAT & 28 foreign satellites on board, on April 1 at 09:30 am”, ISRO tweeted. According to reports, the new variant of the PSLV rocket will first put the 436 kg Emisat into a 749 km orbit and then will brought down to put the 28 satellites into orbit. 🇮🇳 #ISROMissions 🇮🇳#PSLVC45 has moved to the 'umbilical tower' today at the Satish Dhawan Space Centre in Sriharikota. Electrical checks are on now ahead of scheduled launch with #EMISAT & 28 foreign satellites on board, on April 1 at 09:30 am (IST). Weighing about 436 kg, EMISAT based on ISRO's Indian Mini Satellite-2 (IMS-2) bus platform. The satellite is intended for electromagnetic spectrum measurement, the statement said without giving any further details including the end-user of EMISAT. ISRO officials, when contacted, declined to disclose further details.